She loved it! Thankyou for bringing her out of her shell and giving her the confidence to try new things. She had such a great time the first thing she said to me when we picked her up was “when can I come back! He told us that all birthday & Christmas money had to go towards an extended stay at L&E for next year! 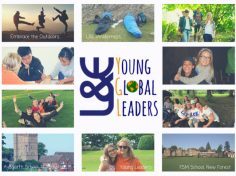 A fantastic opportunity for children to expand their knowledge, experience valuable life lessons – meeting and sharing with others – that they possibly wouldn’t gain elsewhere. All in a safe and fun environment. I just wanted to say en enormous muchas gracias to you and the team for the wonderful trip to Madrid. I had a superb time and learnt so much about your camps and how they help young people to develop. As a teacher that was a great thing to be part of and I hope to take lots of ideas back into school. The pupils have been raving about the trip and they really got so much more out of it than I think they were anticipating. I was very touched by the fact that all of them wanted to stay for longer and are already asking about when they can go again. It was a pleasure to meet you all and of course all the Spanish kids. Thanks to you also Sam for your calm professionalism and solution finding skills. This really helped to steady my own nerves. I can see why your camps are so successful. Looking forward to collaborating with you again in the future. 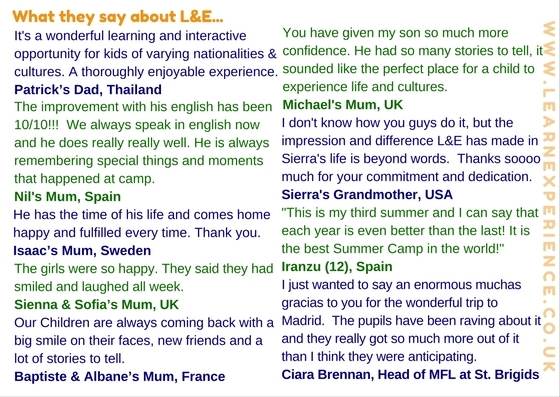 I want to send a massive “THANK YOU” to you and your team for making our daughter, Alice’s time at L&E such a memorable experience. From initially finding you on the internet followed by our 2 1/2 hour trip to Bedale we tentatively approached the school for our welcome meeting on Sunday evening to be warmly greeted by you and Julie who immediately put our minds at rest that Alice would be safe and happy in your caring and capable hands. Alice was excitedly greeted by welcoming camp mates eager to provide the grand tour and whisking her off to show her to the dorm and settle her in. 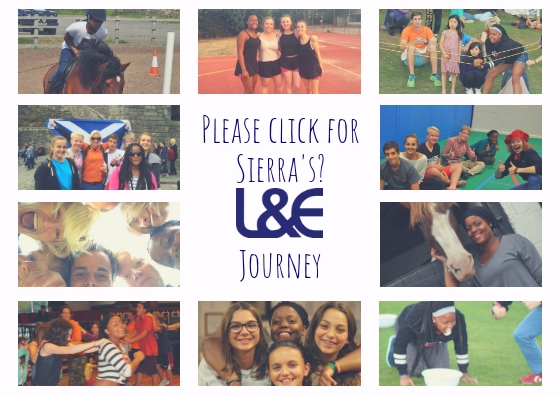 The blogs and photos throughout the week were a welcome and memorable snap shot each day that she continued to have such fun, thank you for the efforts you all put into these, they’re great! On collecting Alice on Saturday morning she had clearly had such great fun and experienced many new things. The fact she’d learned to horse ride in just a few hours was amazing for someone who’s never been on horseback, thank you! The opportunity to meet friends from across the world was another unique and exciting experience for Alice. Please would you pass on our thanks to all your team and especially Julie who is one amazingly kind and fun person. Alice is already planning her return trip so here’s to 2017! Not sure you remember me from around 4-5 years ago but Learn and Experience changed my life drastically. 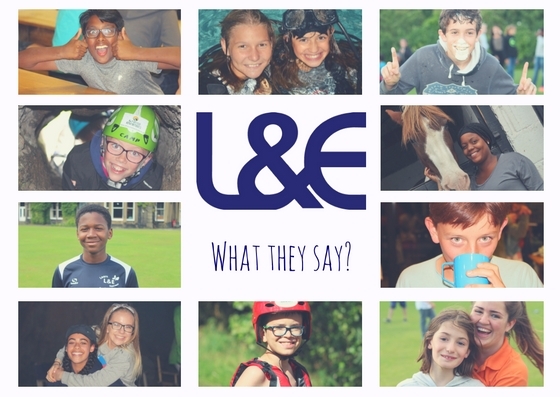 Coming home after every summer was so upsetting for me because I literally had the time of my life every time I was there and I have some of the best memories of my childhood formed at L&E, and I can’t thank you enough for what you did for me. From being a reclusive shy child, your camps helped develop me into the person I am today by introducing me to new activities and cultures from all over the world, it massively helped my confidence in meeting new people and I would go as far to say that it has pretty much allowed me to get the retail job that I have had for the past 2 years and now a place studying business management at Teesside University. Thank you so much for everything.